THE UK Government must get its act together and negotiate a transitional arrangement to ensure Shetland’s £300 million seafood industry can continue selling to EU countries post-Brexit, according to isles MSP Tavish Scott. The Liberal Democrat was speaking following a “constructive” meeting with the EU’s chief Brexit negotiator Michel Barnier in Brussels on Monday morning. Barnier last week warned UK negotiators that there are “extremely serious consequences of leaving the single market and it hasn’t been explained to the British people”. 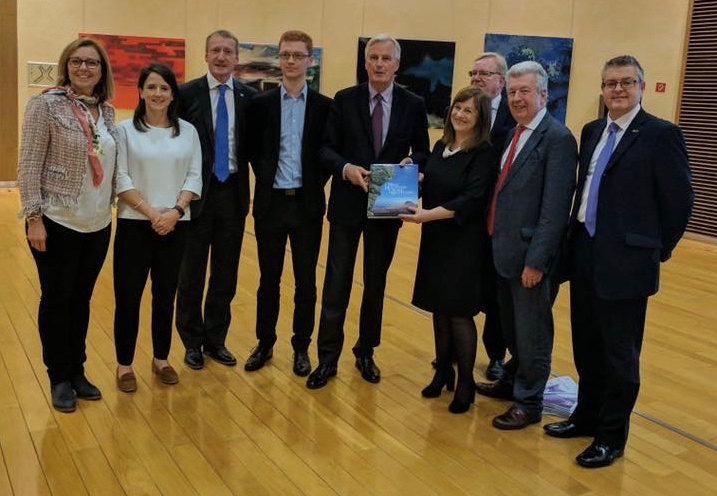 Scott was part of a delegation of MSPs from the Scottish Parliament’s European committee who explored whether there was scope for continued membership of the single market and customs union in a transitional period following the UK’s projected departure date of March 2019. He said afterwards: “I raised with Michel Barnier the importance of seafood exports from Shetland to Europe. I asked what the impact will be of leaving the EU on exports of seafood into European markets and whether he recognised the size of Scotland’s food and drink industries and the scale of Shetland’s £300 million seafood industry. “In particular, I raised the importance of fresh fish landed in Shetland crossing European borders into French and Spanish markets and whether this would be more difficult when the UK leaves the EU and different customs arrangements exist at the English Channel. “As a former French fisheries minister he was well aware of Shetland’s significance both in catching and processing terms. His main point was that nothing should change in the short term as long as there is a transitional agreement between the UK and the EU. Brexit negotiations have endured a fraught start, with Barnier and the UK’s chief negotiator David Davis frequently at loggerheads over fundamental issues including how much money the UK will have to pay to extricate itself from the EU, the Irish border and citizens’ rights. Scott said he sensed Barnier was “frustrated by the lack of negotiating process” and believes the UK Government has yet to “say what they want on lots of issues such as budgets”. “So it is very important that on practical issues such as cross border movements of seafood, the UK Government try to minimise any measures that could make trade more difficult, expensive or waste time,” the MSP said. He added that the European committee at Holyrood was asking Davis to present his position on those issues, and that Barnier had been “crystal clear about asking for complete clarity from the UK Government”. Shetland Fishermen’s Association executive officer Simon Collins said the catching industry’s view was that, while trade discussions are “vital”, “water and markets don’t mix”. He said Scott was right to emphasise the importance of the EU market for the Shetland industry’s produce, but when it came to the terms of trade seafood would not be “unwrapped from the general discussion”. “That will be a high-level political decision and one we would be most unlikely to influence one way or another,” Collins told Shetland News. “At the same time, and totally separately, we insist that access to UK waters must revert to UK control immediately upon Brexit, which is the default position under international law, and not ceded to EU fleets as part of the Brexit agreement. “That would amount to selling the industry down the river yet again, and we have substantial cross-party support to prevent that happening.